If you own one of the more than 3 million trademarks registered with the United States Patent and Trademark Office, there is an excellent chance that a cybersquatter has obtained Internet domain names that are identical or confusingly similar to your mark. Domain names routinely infringe on trademarks. One reason there are so many trademark-infringing domain names is because of the sheer number of registered domain names. More than 202 million Internet domain names have been registered, far more than the roughly 172,000 entries in the Oxford English Dictionary for words in current use. how to determine if a desired domain name might infringe on a trademark. The domain name industry benefits if the public remains ignorant about trademark law and its relationship to domain names. Domain names have become a billion dollar business. The companies that issue domain names and the companies that facilitate domain name appraisals, auctions and sales all have a vested interest in the domain name market. Thus, they are not likely to kill the goose that laid the golden egg by telling prospective domain name registrants and buyers that a particular domain name may be a ticket to a lawsuit or an Internet Corporation for Assigned Names and Numbers (ICANN) arbitration procedure. A trademark owner can search for infringing domain names simply by going to a website that provides a comprehensive database of registered domain names. In a matter of a few minutes, a mark owner with a connection to the Internet can obtain a list of all domain names that contain text identical to a mark. I frequently start with BetterWhois when looking for infringing domain names, although any WHOIS lookup will work. A trademark owner who finds a domain name that is identical or confusingly similar to its mark has several options for dealing with the possible infringement. The owner of an unregistered or common law mark can act against a cybersquatter and seize an infringing domain name. This is the easiest and cheapest course of action, but it runs the risk that the infringing domain names could damage the goodwill of the mark and/or result in the loss of the rights to the mark. if you fail to take the action demanded, I’m going to turn the matter over to my attorney to take appropriate legal action, which will include a claim for damages. This may be worth a try. In my experience, however, the letter from the mark owner is usually ignored. If it works, great; if it does not, you have lost some time but still have the option to escalate the matter. If the infringer is willing to enter into a license agreement governing the use of the mark (which may be unlikely), the mark owner can counter a claim that it failed to adequately police infringing uses of the mark with the argument that the other party was not infringing because it used the mark under the license agreement. The drawbacks to this alternative are that it may cost money to negotiate, prepare and sign the license agreement; the terms of the license may be less than satisfactory; and the licensee continues to use the mark. This approach costs money (maybe less than a lawyer-prepared trademark license agreement), but it does greatly increase the chance that you will get the desired result. It is common for an infringer without substantial resources to comply with the mark owner’s demands rather than risk being the defendant in a lawsuit or an ICANN Uniform Domain Name Dispute Resolution Policy (link) action. On the other hand, if the infringer is making money from the infringing domain name, it is likely that a lawyer’s cease and desist letter will be ignored. All registrants/owners of domain names are subject to an arbitration procedure known as ICANN’s Uniform Domain Name Dispute Resolution Policy (UDRP). This policy is a fantastic weapon for trademark owners that can be used to obtain ownership of infringing domain names relatively quickly and cheaply. Mark owner files a complaint (maximum length of 15 pages) and pays an arbitration fee (approximately $1,300 for the first domain name at issue). Domain name owner has 20 days to file an answer. Mark owner has an option to file a reply to the answer within five calendar days of the date the answer is received. The arbitrator usually rules within 14 days. If the mark owner wins, the domain name will be transferred to the mark owner within 10 days of the decision unless the domain name owner files a lawsuit within the 10 day period in the appropriate court seeking to prevent the transfer. A UDRP arbitration can be filed, won and the infringing domain name transferred within 50 to 60 days, start to finish. Because the only documents a mark owner files in a UDRP action are a complaint and an optional reply, and does not include discovery, briefs, trial or appearance before the arbitrator, the mark owner’s legal fees should be substantially less than an infringement lawsuit. But the ability of the infringer to defeat the arbitration decision by filing suit can greatly increase the potential costs of using arbitration. This is especially true when the cybersquatter is located in a foreign jurisdiction because part of filing the arbitration is agreeing to submit to the jurisdiction of a court where the cybersquatter is located (at least for review of the arbitration decision). For example, if a Turkish cybersquatter files suit in Turkey to challenge the arbitration decision, are you really going to litigate in Turkey? Also, if the jurisdiction allows claims based on harming someone’s business, these can easily be added to the suit the cybersquatter files to defeat the arbitration decision. Generally, any real likelihood that the cybersquatter will appeal an unfavorable arbitration decision counsels choosing a trademark infringement suit over the UDRP arbitration. While the cost to the trademark owner is potentially higher, the cybersquatter’s costs are higher as well. People facing real costs are always more motivated to settle than those who have nothing to lose. The ACPA is a decade-old addition to the Lanham Act. It gives trademark owners another powerful weapon to use to obtain infringing domain names. The downside to filing a lawsuit is that the mark owner will incur substantially more time litigating the matter than would be required in UDRP arbitration and potentially higher legal fees. The only remedies in a UDRP action is an award from the arbitrator instructing the registrar of the domain name to cancel, transfer or otherwise make changes to domain name registration. A mark owner who seeks other remedies, such as money damages or an injunction against ongoing infringement, must file a lawsuit under the Lanham Act or other applicable laws. An ACPA lawsuit can be very effective. The mark owner is entitled to actual damages, or alternatively, the court can award statutory damages of up to $100,000 for each infringing domain name. In one ACPA lawsuit, the notorious typosquatter John Zuccarini was ordered to pay statutory damages of $500,000 for five infringing domain names plus the mark owner’s attorneys’ fees and costs of more than $60,000. Trademark owners should use the resources of the Internet to monitor their marks periodically for possible infringing domain names. If an infringing domain name is found, the mark owner should take appropriate action to protect the mark and prevent future infringement. ICANN’s Uniform Domain Name Dispute Resolution Policy and the Anticybersquatting Consumer Protection Act give mark owners powerful tools to stop infringing domain names and obtain ownership of the domain names. Mark owners who fail to properly police infringement of their marks risk finding that they have lost their rights in the mark. Thanks for the insightful article. I have a copyright registration certificate from USCO (Copyright Office) for a particular term. I see that a domain squatter is sitting on the .com term for that domain, while I have quickly registered the .net domains. How can I take the domain back. Do I need a trademark or registered copyright with sufffice. I also see that the squatter has used the name as a twitter username. Can I approach twitter also to ask them to cancel the name ? If you’re not sure what to do after watching that video, it’s time to hire an attorney to help you. Again, likely a good idea to consult an attorney. I have not been able to find an answer to this question. I started a business built on a name, Finescents for retail perfume sales both online and brick and mortar. There were no conflicting trademarks, so I obtained the trademark for the above scope. I have a retail website under finescents.net and own finescents.org, and would obviously like the .com address. It is not in use but owned and represented by Uniregistry. They offered to sell it for $50,000 which is pretty ridiculous compared to other addresses of similar length and wording. I have now been offered to buy it for $10,000, or the seller will “sit on it and monitor your business, selling it to you for more once your business is successful”. Do I have any recourse to obtain the website for a reasonable amount, with the name being trademarked and in use for nearly two years? Thanks for any information! I’m not a lawyer and this is not legal advice. Trademarks, UDRP and other legal advice should be discussed between you and a lawyer. Every domain name and situation is different. I am not a lawyer, nor do I provide legal advice. It looks like your trademark was registered in 2015 (http://www.trademark247.com/tm-finescents.html) and it looks like the domain, finescents.com, was registered back in 2001 (2001-09-03, https://whois.domaintools.com/finescents.com). Therefore, it appears that the current registrant didn’t register it in bad faith to take advantage of your trademark (one of the criteria of winning a UDRP case). It appears to me that you have a few options: negotiate (terms, payment plan, price, lease, etc. ), change your name, or continue to operate using the .net TLD of your name. Plenty of other sites use a .net domain name successfully. At the end of the day, it becomes a business decision for you. What are the prospects of building a large business on that domain name? Can you build a larger one with another domain name? How much would alternative names/brands cost you? I’ve launched many companies in the past two decades and naming/branding is always hard. Best wishes to you. Thank you so much Michael! That’s a lot of info, I figured I didn’t have much recourse. Time to educate myself! You used quotation marks here… “sit on it and monitor your business, selling it to you for more once your business is successful”. But you don’t say where that comes from. Is it from a salesperson at Uniregistry? I hired on person in my company to open an online shop with brand name. She was fired but did not hand out all the information about the domain name. She registered it with her name. We have invested in the conception of the project and we had to buy a new domain name but with .net. Tha problem is, she is using the .com to link it on other website with similar name as ours. 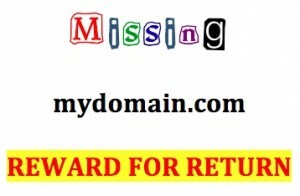 Now, we want to rescue the domain name she has which is our but I do not know how to do or how to issue her for that. Need any help from anyone. Have your attorney send her a letter. That will likely work to get the domain back pretty quickly. Should that fail, take her to court. Your HR department should have her mailing address. Should that fail, hire a private investigator to find it so you can serve her your attorney’s letter. If you hand register names like C7Medical.com , U9Systems.com or something highly similar..
Can someone who owns a a company “U9 Systems” Sue you just for having the domain name? Undeveloped,un parked etc. I ask because I have a few,maybe,random typed H1/B1 .com,s and one day I checked on Google,and One of these companies actually Exist, and claim they own the exact very same .Com I did,but Im guessing their directory was made years and years before,so they obviously dropped that domain name because I hand registered it. Can they pop up one day,and Sue me for it even though they preivously owned it and obviously didnt value it enough to Keep it,knowing someone else could register it? Anyone can sue you for anything. You don’t need to be in the “right” to sue anyone, or even file a UDRP case against you. Having said that, you’re less likely to get sued or have a UDRP case filed if you don’t register any domain names that contain or are trademarks. If you stay clear, you should be fine. Only wondering how the added complexity of a Private Whois affects the steps you outline above. If one sends a Cease and Desist to the Private Whois address, can we assume that it makes it to the actual registrant? I especially like the progression of actions, from lowest cost and effort, to highest cost and effort. It’s useful to know the range of costs, as well, as most writers say “do a UDRP” but don’t tell you how much. Thanks for providing that information. I can’t wait for more of your articles!